Musings on videogames, and to a smaller extent, the world they encompass! A new lick of paint, a name change and more on those darn Pokemans! The first thing you’ll be noticing is that I decided to decorate. Gone are the barren grey borders, and in their place is a wonderful background piece built from the ground up by a work colleague and a very good friend, Andy “Skyrat” Smith. He’s also put together a funky new logo for the blog. It feels much more unique and I love the distorted effects. The guy’s got skills! I’m working on a Q&A feature to be called “Friends of LOAD/ERROR” but for now, you can check out Andy’s amazing comic Th3m Three right here. Show it some love! How cool is THAT? I’m thinking of getting business cards! The old address will still get you here. But again, the blog feels much more homely with a snappy title like this. Please help me to get this name change out and about. Share it on social media, tell your gaming friends, heck – Get the messenger pigeons! What else have I got for you? The love/hate relationship with Pokemon Go continues. Due to current blog/work/life commitments (delete as applicable) PGo is probably the only game I’ve invested any real time into. I am furious with the server performance of this game, yet when it works I am totally hooked. 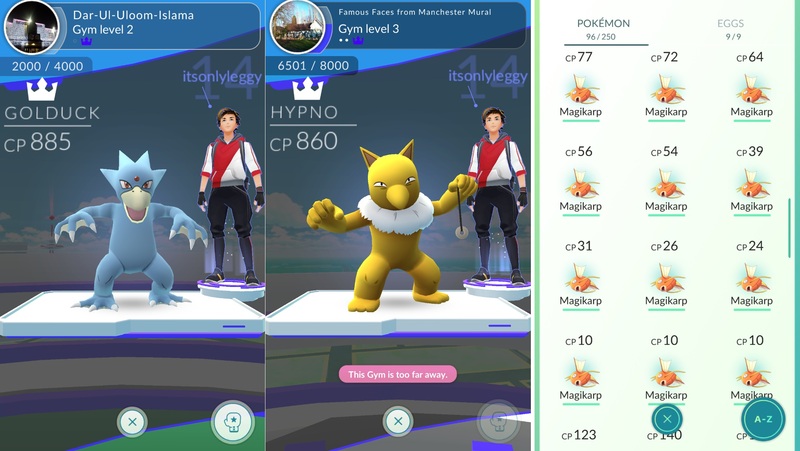 The recent high point was my first venture into Gym battles. 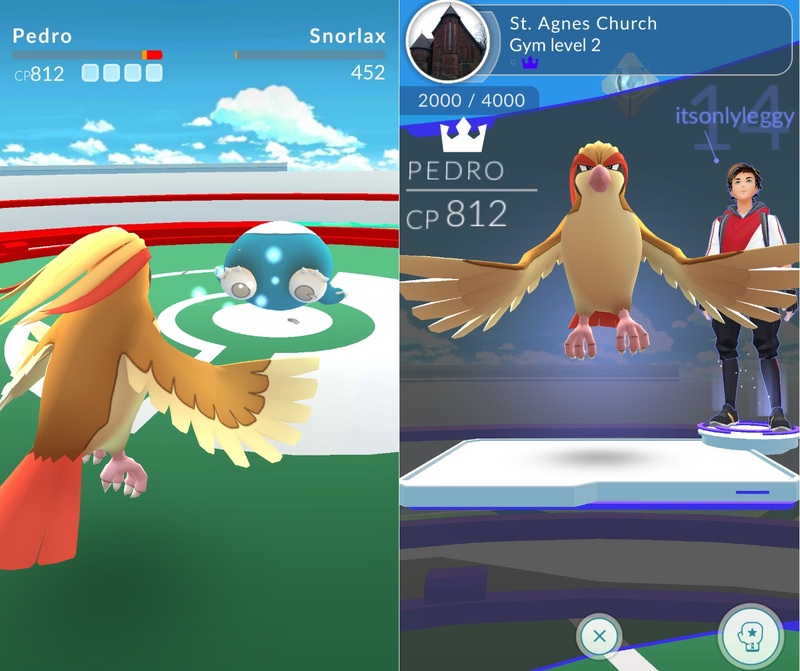 I represent the blue boys of Team Mystic, and thanks to the hard work of Pedro, my Trusty Pigeot, I won my first battle and captured a gym. Felt great to see my name up in lights! Two more gyms would fall that day, as I got into the swing of things. Also, the relentless hunt for Magikarp continues. You need 400 candies to evolve Magikarp into your very own Gyrados (Pronounced Garra-dose) who I will inevitably nickname Gary. A workmate caught him with ease and simply shrugged her shoulders. Me? Out of “Great” Pokeballs, and desperate. Slinging bog standard Pokeballs and Raspberries as if my life depended on it. Blastoise seemed to laugh at my attempts, batting these balls away for fun. After breaking out of a capture for the 15th time…. he fled in a puff of smoke. Crestfallen is a good word here. It was a lesson. NEVER let your item supplies run low…. you never know when something might come in handy. The adventure continues, and today I hatched an Onyx (huge rock Snake Pokemon) from an egg. Impressive! Please don’t forget the competition I’m running here for funny Pokemon pics – we’ve got some crackers already! Don’t be shy, just contribute! Away from the world of Pokemon – I have a game you ALL need to try. It’s called Life Is Strange, and is an Episodic adventure where two old estranged friends are reunited by fate… and one of them discovers she has the power to rewind time. The game is written superbly. It can flit between pulse-pounding drama and moments of quiet reflection in a matter of minutes. You have to make choices throughout that will have a real impact on the characters in this world, and you’ll be questioning your own morality at times. It’s got some very deep messages and a fantastic soundtrack to boot! The reason I’m talking about Life is Strange is because Chapter 1: Chrysalis is FREE on PS4, Xbox One and Steam right now! Go and snap it up, it’s an experience you won’t want to miss. Link is right here. I think that’ll do it for now folks. Click the buttons and keep coming back! Posted on July 22, 2016 July 22, 2016 by itsonlyleggyPosted in Miscellaneous, ModernTagged Freebies, Pokemon, Update. Previous Previous post: Introducing: The Flash Cartridge! Next Next post: A Blast from the past – Bad Influence! I played Life is Strange last year and was a really nice surprise, loved the game start to finish, the story, the soundtrack, some emotional moments… I also recommend to play it or, at least, give it a chance now the first episode is free, as you’ve said. Thanks for backing me up! I waited for the full retail version to come out last year, don’t think I could have handled the cliffhanger endings between chapters otherwise! It really is powerful stuff. I’d love to see Dontnod bring out another adventure game with a different story and different characters! Musings about Video Games, and to a smaller extent, the world they encompass! Please support my blog by clicking one of these buttons. You'll never miss a post!